Pad thai was served during lunch recently at Boston University’s Warren Towers. 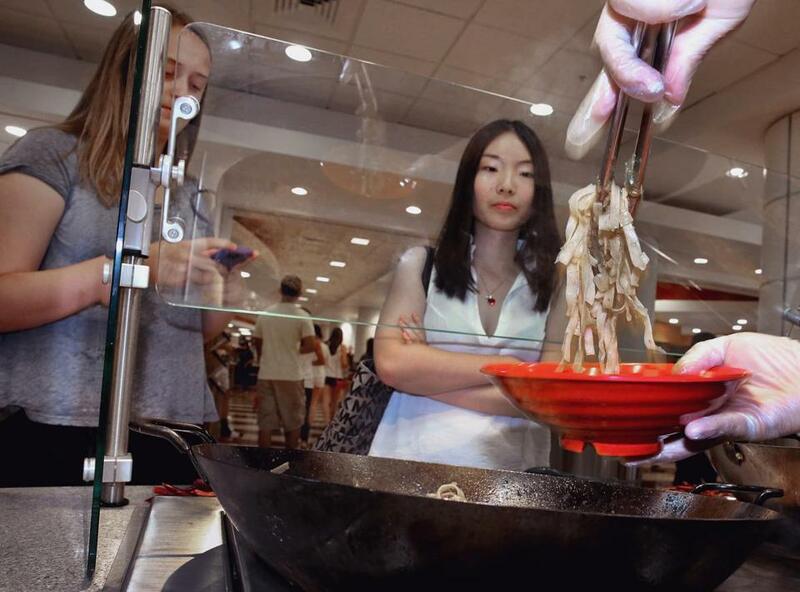 The growing legions of Chinese students who eat at Boston University dining facilities for too long have faced fortune cookies, egg rolls, and other fare that isn’t actually Chinese. But this year, the more than 3,100 Chinese who go to school on Commonwealth Avenue will no longer have to endure sorry American substitutes for their home cooking. The university, responding to feedback from its growing population of Asian students who have called for more authentic options, has opened a new dining hall station that aims to serve traditional Asian cuisine. Chefs scoured cookbooks, restaurant websites in Asia, and consulted specialists to learn dishes and techniques to appeal to more than 4,000 Asian students at BU. The result is a station that offers Szechwan chicken, Korean kimchi, and Vietnamese beef rice noodle soup. Similar to many universities around Boston, the number of international students at BU, especially from China, has grown rapidly in recent years. The school added more than 1,000 Chinese students over the past two years and this year, one-quarter of its freshman are from other countries. The authentic cuisine project, which involved specialists from the Culinary Institute of America who trained BU cooks in Asian techniques, debuted this month, and drew long lines of hungry students. The new station, located in the Warren Towers dining hall, serves a rotating menu of recipes from China, Thailand, Japan, Vietnam, Malaysia, and Singapore. 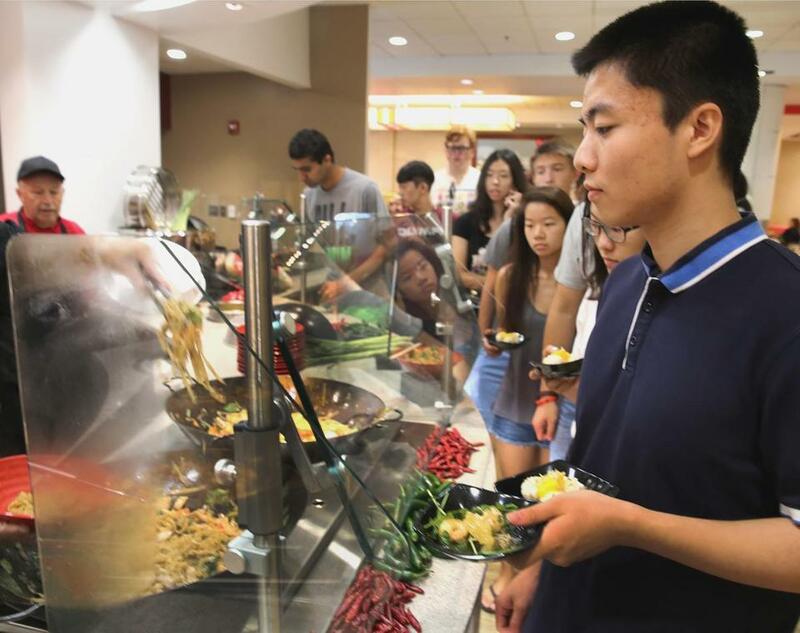 Asian students, including many freshmen experiencing their first week at a US university, gave the new food a hesitant thumbs up. “It’s pretty different from my home country, but I like it, I like the diversity here,” said Elvis Hua, a freshman from Wuxi, China, who has a dining plan that allows him unlimited trips to the college’s four cafeterias. 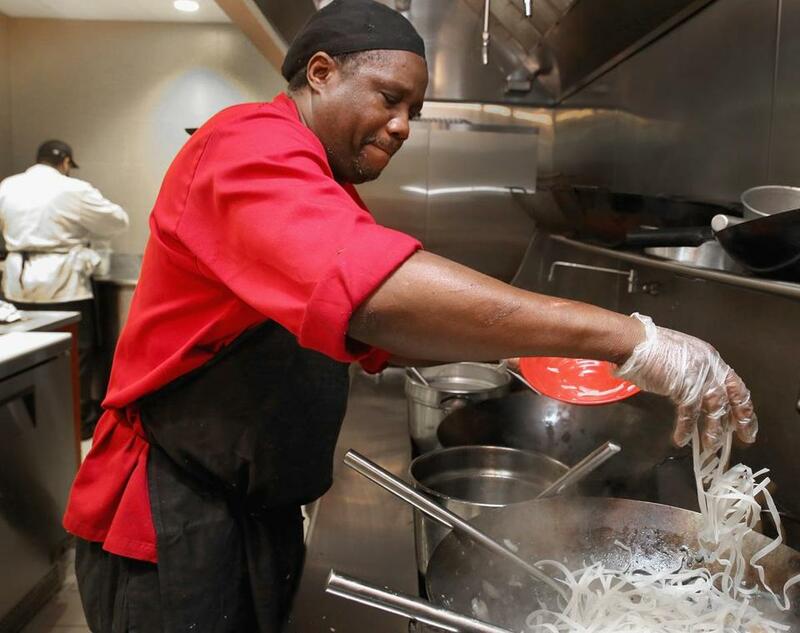 Assistant chef Elvis Martin added rice noodles to a wok of stir fried pad thai. Standing in line, Hua and other Asian students described their favorite foods from home: Beef noodle soup, hot pot, a warm cabbage dish with vinegar the English name for which a student didn’t know. Or perhaps it doesn’t exist. “I prefer the food in this station because I’m Chinese, but sometimes it’s not that kind of Asian — it’s kind of like American Asian,” said Kylie Zhao, a freshman from Jinan, China. Any American who has sought familiar cuisine in a foreign country only to be served French fries with mayonnaise or spaghetti bathed in ketchup will sympathize. At the front of the line at Warren Towers, a cook handed students red bowls steaming with rice noodles, vegetables, and chicken, the Thai speciality known as drunken noodle. Warren Towers executive chef Kurt Steinberg might not be Asian, but he has immersed himself in the cuisine to try to come as close as possible, while still pleasing American palates. His goal was to create “not like mall-type Chinese food,” Steinberg said, and it wasn’t easy. Recipes required new ingredients, like rice noodles; new equipment, like cavernous woks; and more preparation. He now has four kinds of soy sauce: dark, light, sweet, and mushroom. Steinberg and his staff spent the summer testing out his 28-day menu rotation. Some dishes started out far too spicy for American tastes. Steinberg toned it down, but there are plenty of bottles of Sriracha in the dining hall, for those who like heat. American students line up at the Asian station, too. On a recent day, Jenna Kwon, a BU freshman from Chicago, surveyed the offerings. Kwon, whose family is originally from Korea, said she’s not the best judge of whether the food is authentic, but said it tastes all right. “I feel like it might be in between. Better than Panda Express, but still Americanized,” she said. Students stood in line at the Warren Towers dining hall.